This tutorial provides you with a foundation for working with Adobe After Effects interface. It is the second lesson in the Adobe After Effects CS6 Digital Classroom book. For more Adobe After Effects training options, visit AGI’s After Effects Classes. You can save modifications you make to a workspace and save them as a new, customized workspace. Custom workspaces allow you to show only the panels you require. Here you will save a custom workspace. 1 Choose Window > Workspace > New Workspace to open the New Workspace dialog box. 2 Name your workspace Animation-Modified and click OK to save it. 3 Choose Window > Workspace. You now see the name Animation-Modified among the list of available workspaces. Additionally, you should note that it currently has a check mark next to it indicating that it is, in fact, the currently active workspace. 4 Click in any section of the After Effects interface to close the Window menu without changing the workspace. When you create a custom workspace, you are actually modifying the configuration of the workspace you originally started with. For example, in the preceding lesson you started in the Animation workspace. After adding panels, removing panels, and saving the custom workspace, the initial workspace does not automatically reset back to its original appearance. However, you can quickly return to the original workspace and reset it to its default configuration. 1 Choose Window > Workspace > Animation to return to the Animation workspace. Notice that it still looks exactly like the Animation-Modified workspace you created in the preceding part of the lesson. 2 Choose Window > Workspace > Reset ‘Animation’ to open the Reset dialog box. 3 Confirm the workspace reset by clicking Yes; the Animation workspace resets to its original appearance. You must always confirm that you want to reset a workspace to its default appearance. Preferences are used to control many aspects of the After Effects application, including the way the interface displays, the way it works with external files, and even your system’s memory (RAM) behind-the-scenes. The location of the Preferences dialog box is different on the Mac OS and Windows operating systems. Depending on your OS, you will access the Preferences dialog by choosing After Effects > Preferences (Mac OS) or Edit > Preferences (Windows). The Preferences dialog box is divided into several categories. Understanding each section of this dialog will help you quickly modify the application to fit your specific needs. General: Contains the commands that don’t easily fit into any other group. In this section, you can control undo states, whether to show tool tips, and whether to use the operating system shortcut keys. Previews: Specifies the settings for all preview operations. In this section, you can set Audio Preview duration, Adaptive Resolution quality, and whether to use hardware acceleration to aid in previews. Display: Mostly used to set options for how motion paths are displayed, but you can also specify whether to use Project panel thumbnails and Info panel rendering displays. Import: Contains options for setting the default image duration of imported still images and embedded alpha channels, and how to handle drag-and-drop import. Output: Specifies options for segmenting files on output and whether or not to use a default filename and folder. Grids & Guides: Specifies the color and style of grid and guide lines, as well as the screen size the action and title-safe grids should encompass. Labels: Sets the default color and name for labels used in the Project and Timeline panels. Media & Disk Cache: Enables and sets the location of disk and media cache folders. The cache is a storage area for conformed media files and other temporary files that are needed to optimize the After Effects workflow. Video Preview: Specifies the external FireWire device, such as a camera or deck, to output video to during preview operations. Professionals generally use an external monitor to check color, motion, and safe margins during graphics or video work. Appearance: Specifies the options for controlling the appearance of the interface and color highlighting of labels and masks. Auto-Save: Allows After Effects to save a copy of your project file at set intervals. You can specify the interval for the Save command as well as the number of versions of your project file the application will create before it begins to overwrite them. Memory and Multiprocessing: Sets a value for the amount of RAM to use for other applications. In general, the greater the amount of RAM that After Effects and the other applications of the Creative Suite can utilize, the better the applications perform. Audio Hardware: When using a system with multiple audio input or output devices, you can specify which device is used by After Effects when playing back or capturing sounds. Audio Output Mapping: Specifies how sound is played back or mapped to the system’s selected audio devices. You can use the Undo command to take back, or undo, a mistake. In After Effects, you can step back through several errors one step at a time. By default, After Effects lets you undo the previous 32 steps you performed, but you can modify this limit using your preferences. 1 Choose Edit > Preferences > General (Windows) or After Effects > Preferences > General (Mac OS) to open the Preferences dialog box. 2 Change the Levels of Undo from the default 32 to 50. 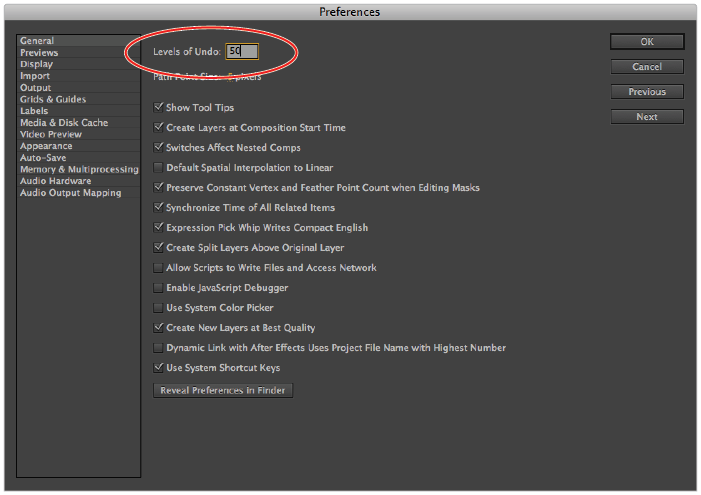 Change the Levels of Undo in the Preferences dialog box. The default value for Auto-Save is every 20 minutes and a maximum of 5 project versions. You can adjust these amounts to fit your personal needs. Because this feature is not saving over your original file, but instead making a copy, you can set the amount for Save Every to the minimum value you can tolerate. Keep in mind that when the Auto-Save function runs, it can disrupt your work. The Levels of Undo that your computer can support are based on the amount of RAM available on your system. The greater the value that you set, the higher the RAM requirements. If you are working on a computer with a limited amount of RAM, you should keep this at the default setting, or possibly lower it. Unfortunately, computer programs can crash and you can lose your work. You should get in the habit of saving your projects frequently to avoid losing your work if your software crashes or power to your computer is interrupted. After Effects has an Auto-Save feature, which automatically saves a copy of your project file as you work. You can set how often the Auto-Save runs and how many copies of your file it saves. 1 If it is not already open, choose Edit > Preferences > General (Windows) or After Effects > Preferences > General (Mac OS) to open the Preferences dialog box. 2 Click the Auto-Save category on the left. 3 Click on the checkbox labeled Automatically Save Projects to enable the program to automatically create backups of your project file at its default settings. 4 Click OK to close the Preferences dialog box. Once you enable the Auto-Save function, After Effects will create a folder in the same directory as your project file named Adobe After Effects Auto-Save. The auto-save process creates enumerated backup copies of you project file. So a project named Moving Logo.aep would be backed up as Moving Logo auto-save1.aep in this auto save folder. To access this backup folder in case of a crash or to return to a previous project state, choose File > Open in After Effect, navigate to the auto-save folder and open the desired project normally. See available After Effects Classes and learn from the expert instructors at American Graphics Institute. In-person classes at our locations, online courses, or private training is available. See our After Effects Classes and learn from the expert instructors at American Graphics Institute in small classes or through private training.